Infrared laser ablation coupled to vacuum capture was employed to collect material from fingermarks deposited on surfaces of different porosity and roughness. Laser ablation at 3 μm was performed in reflection mode with subsequent capture of the ejecta with a filter connected to vacuum. Ablation and capture of standards from fingermarks was demonstrated on glass, plastic, aluminum, and cardboard surfaces. Using matrix assisted laser desorption ionization (MALDI), it was possible to detect caffeine after spiking with amounts as low as 1 ng. MALDI detection of condom lubricants and detection of antibacterial peptides from an antiseptic cream was demonstrated. Detection of explosives from fingermarks left on plastic surfaces as well as from direct deposition on the same surface using gas chromatography mass spectrometry (GC-MS) was shown. The online version of this article (doi: 10.1007/s13361-017-1703-2) contains supplementary material, which is available to authorized users. Latent fingermarks have been used for over a century in the context of forensic science and are the most common evidence for biometric identification [1, 2]. Fingermark impressions can be visualized on porous, semiporous, or nonporous surfaces, and several enhancement techniques have been employed , for example developing powders , chemical reagents , and nanoparticles . These techniques can produce a high-quality fingermark image but provide limited information on its chemical composition. In addition to the identity of the donor, the chemical components of a fingermark can reveal information about associated drug, explosive, or weapon use [7, 8, 9]. Spectroscopic approaches have been used to image latent fingermarks while providing some indication of chemical markers, but they cannot routinely achieve unequivocal compound identification [10, 11]. 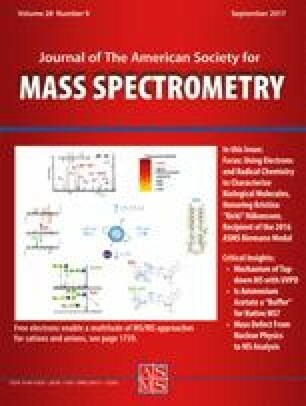 In the last decade, several mass spectrometry (MS) techniques have been employed that utilize chemical imaging approaches [1, 6]. Much of the published work relies on laser ionization techniques such as matrix assisted laser desorption ionization (MALDI) [6, 12, 13, 14], substrate assisted laser desorption ionization (SALDI) , laser desorption ionization (LDI) , and desorption ionization on porous silicon (DIOS) , which can ionize a broad range of molecules with a lateral imaging resolution of 10 μm. Higher lateral resolution can be achieved with secondary ion mass spectrometry (SIMS) , where a focused ion beam is directed at the surface. In addition to vacuum ionization, ambient ionization techniques such as desorption electrospray ionization (DESI)  can be performed with minimal sample preparation and have been employed in forensic analysis . With DESI, highly charged electrospray droplets are directed at the surface, wetting it and extracting some of the chemical components. Secondary droplets are removed from the surface with the nebulizing gas and form ions through the electrospray droplet evaporation process. While this approach has been tested for forensic applications, compatibility with crime scene investigation (CSI) forensic techniques has not been reported. In addition, the lateral resolution and sensitivity in imaging mode pose challenges for trace detection. Another technique that utilizes ambient mass spectrometry is direct analysis in real time (DART) [20, 21], which has been used to detect compounds of interest from surfaces such as swabs and condom packages. With DART, metastable ions from a glow discharge are directed at the surface, and volatile species heated and desorbed from the sample are ionized by chemical ionization. DART ionization sources have been coupled to portable MS systems . However, in many cases these techniques require analysis in a laboratory environment using specific surfaces and materials, whereas forensics evidence is often found in the field on difficult to sample surfaces. Whereas imaging provides a chemical image of the fingermark , the chemical composition can also be acquired by analyzing large portions of a fingermark after extraction and concentration. Sample collection for mass spectrometry can be achieved with swabs and, in the case of fingerprints, lifting tapes after enhancement. Both swabbing and lifting have been coupled to mass spectrometry, but challenges such as low sampling efficiency [24, 25], operator-related variability , and sample contamination  have been reported. The causes are several, but all stem from the analytes of interests not being efficiently absorbed onto the sampled surface. In addition, the porosity of the surface can greatly influence the sampling efficiency. For example, sample collection from highly porous materials may be more effective if vacuum aided . Nevertheless, the fingermark sampling methods described above allow mass spectrometry of a broad range of molecules and surfaces, which complements imaging techniques. Several new methods for sampling fingermarks for mass spectrometry have been developed. Microextraction of particulate components from fingermarks with subsequent nanoelectrospray ionization mass spectrometry has been used for detection of drugs of abuse in the picogram range . This approach is sensitive; however, the microtweezers and manipulators required for extraction do not allow for transportability. In addition, liquid extraction requires a range of solvents to efficiently extract all of the materials of interest. Nevertheless, sample collection and extraction approaches for off-line mass spectrometry can be used in combination with gas chromatography (GC) [28, 29] and liquid chromatography (LC)  to characterize both the endogenous and the exogenous chemical composition of fingermarks. Laser ablation sampling can be used to extract analytes from a surface of interest . For example, ultraviolet (UV) laser ablation has been used with mass spectrometry utilizing liquid capture , laser microdissection , and laser ablation inductively coupled plasma mass spectrometry . Mid-infrared (IR) lasers can be used to ablate a wide range of molecular species. In particular, ablation at 3 μm results in efficient material removal from surfaces containing water or other compounds with OH or NH group vibrational absorption . Mid-IR ablation can achieve almost complete material removal from surfaces [36, 37], [38, 39]. Coupled to vacuum capture, IR laser ablation can sample a specific region of a sample without contact. Unlike swabbing, IR ablation does not require a solvent. The sacrifice of the fingerprint, which is destroyed during the sampling process, is a tradeoff for the lower limit of detection compared with direct ionization methods. In this work, results demonstrating laser ablation and capture of chemicals from fingermarks enhanced with carbon powder are presented. An IR laser system at 3 μm wavelength was used to ablate fingermarks from different surfaces with vacuum-assisted capture of the plume using a commercial syringe filter. Initial experiments were conducted using caffeine as standard and MALDI mass spectrometry as a fast detection technique. The effects of laser pulse energy were investigated to optimize material removal, and the system was used to sample various compounds from glass, plastic, aluminum, and cardboard surfaces, each with different porosity, with subsequent detection by mass spectrometry. Trifluoroacetic acid (99.5%, LC-MS grade), dichloromethane (99.0%), and acetonitrile (99.9%, LC-MS grade) were purchased from Fisher Scientific (Atlanta, GA, USA). Ultrapure water (>18 MΩ·cm) was produced in-house. A standard mixture of explosives, EPA 8330 Mix A, containing a 2-amino-4,6-dinitrotoluene (2-ADNT), 1,3-dinitrobenzene (DNB), 2,4-dinitrotoluene (DNT), octahydro-1,3,5,7-tetranitro-1,3,5,7-tetrazocine (HMX), nitrobenzene (NB), 1,3,5-trinitroperhydro-1,3,5-triazine (RDX), 1,3,5-trinitrobenzene (TNB), and 2,4,6-trinitrotoluene (TNT) was purchased from Sigma-Aldrich (St. Louis, MO, USA). Neurotensin, insulin, cytochrome c, trypsin, bradykinin fragment 1–7, bradykinin fragment 2–9, adrenocorticotropic hormone (ACTH) fragment 18–39, angiotensin II, luteinizing hormone releasing hormone (LHRH), [Glu1]-fibrinopeptide B (Glu-Fib), α-cyano-4-hydroxycinnamic acid (CHCA), and caffeine (99%) were purchased from Sigma-Aldrich. Plain glass microscope slides were purchased from VWR (West Chester, PA, USA). A fingermark kit, including powder and brush, was obtained from Lynn Peavey Company (Lenexa, KS, USA). Condoms (Trojan brand) were obtained from Church and Dwight (Princeton, NJ, USA). Topical antibacterial cream (Neosporin) was obtained from Johnson and Johnson (Ewing, NJ, USA). Polyvinylidene fluoride (PVDF; Whatman) syringe filters were obtained from GE Healthcare (Chicago, IL, USA). Stock solutions of caffeine were prepared with ultrapure water at 5 mM concentration. For initial experiments, stock solutions were further diluted with water and aliquots were placed on the surface of interest, air-dried, and ablated. To create fingermarks, fingers from volunteers were exposed to standards and other compounds by pressing them on a dried residue of analyte and subsequently pressing the finger against a second surface. Four different materials with varying porosity and roughness were tested: three nonporous (soda-lime-silica glass, polystyrene plastic, and aluminum), and one porous (cardboard). Blank fingermarks were produced by pressing a finger on the second surface without touching any standard. Enhancement of all fingermarks was achieved by gentle brushing with carbon black powder. Surfaces with dried standard or enhanced fingermarks were mounted on a two-axis translation stage (M-433; Newport, Irvine, CA, USA) operated using motorized actuators (LTA-HS, Newport) and a motion controller (ESP3000, Newport). Stages were moved at a speed of 1 mm/s. The laser ablation system used has been previously described [37, 39]. Briefly, the system includes a tunable wavelength pulsed nanosecond IR optical parametric oscillator (IR Opolette; OPOTEK, Carlsbad, CA, USA), which irradiated the samples using a reflection geometry configuration. The beam was directed at the target at a 45° angle and focused with a 50 mm focal length lens. The wavelength was 2940 nm and the repetition rate was set to 20 Hz. The laser diameter was approximately 200 × 300 μm and fluences between 14 kJ/m2 and 55 kJ/m2 were used. A commercial syringe filter with a Luer-lock connector and equipped with a 4 mm i.d. PVDF membrane was held approximately 1 mm above the sample. Vacuum was provided by a mechanical vacuum pump. The stages were operated in raster mode, with a distance of 150 μm center to center and a serpentine trace pattern. Ablation of 5 × 5 mm regions on a fingermark were achieved in about 3 min. Upon completion of ablation and capture, the filter was removed and the collected sample was eluted with 50 μL of solvent and collected in a microcentrifuge tube. The front side of the filter was further washed using 10 μL of solvent, delivered with a micropipette, and transferred to the collection tube. The extract was analyzed directly or vacuum dried and stored at −20 °C until used. For MALDI analysis, a saturated solution of CHCA in 1:1 H2O/ACN containing 0.1% TFA was used as the matrix. Unless otherwise indicated, a 1 μL volume each of sample and matrix were mixed on a steel target plate and allowed to dry before loading the target into the instrument. A complete overview of the method is presented in Supplementary Material Figure S1. Microscope images were acquired with a fluorescence stereomicroscope (SteREO Lumar V12; Zeiss) equipped with a 0.8× Neolumar S objective and a high-resolution digital camera (AxioCam HRc; Zeiss). Images were recorded in bright field mode and exported using Zen 2012 (Zeiss). MALDI mass spectra were obtained using a MALDI-TOF/TOF mass spectrometer (UltrafleXtreme; Bruker Daltonics, Billerica, MA, USA). Each spectrum was produced using 300 shots at 1000 Hz in partial sample random walk mode as previously described . A total of 12 spots at 25 shots per spot were averaged to produce the final spectrum. GC-MS spectra were obtained using a GC (Agilent 7890B; Agilent, Santa Clara, CA, USA) coupled to a single quadrupole mass spectrometer (Agilent 5977A MSD) using electron ionization (EI) at 70 eV with an Agilent J&W DB-5 column with a diameter of 0.15 mm and length of 30 m. The injection volume was set to 1 μL in splitless mode. The temperature program was run at 100 °C for 2 min, increased to 200 °C at 10 °C/min, then increased to 250 °C at 20 °C/min, and held at the end of the run for 5 min. MALDI spectrum analysis was conducted using FlexAnalysis 3.0 software (Bruker). The instrument was calibrated with a tolerance of 50 ppm. Peak identification was performed in centroid mode and peaks with signal to noise ratio below 3 were not considered. Both chromatograms and spectra were plotted using KaleidaGraph (ver. 4.5, Synergy Software Reading, PA, USA). Before plotting, MALDI spectra were processed with in-house software (LabVIEW, National Instruments) and data points were reduced to 2500 by averaging. GC-MS chromatograms and spectra were recorded using MassHunter GC/MS Acquisition (Agilent, ver. B.07.02.1938). Data were visualized with MSD ChemStation (Agilent, ver. G1701FA.01.01.2317) and spectra were searched using NIST Mass Spectral Search Program using the NIST/EPA/NIH Mass Spectral Library (ver. 2.2, built June 10, 2014). Identification was considered to be achieved if the top scoring result had a confidence threshold of 90%. Initial studies were aimed at assessing the effect of laser ablation transfer from different surfaces, which included soda-lime-silica glass, polystyrene plastic, cardboard, and aluminum. Each surface was ablated without any additional treatment to assess potential damage using fluences from 14 to 55 kJ/m2. Before ablation, a finger was gently pressed on each surface in order to leave a clear fingermark without notable smearing. Enhancement of the fingermark was achieved by gently applying black carbon powder with a brush, taking care not to distort the print. Figure 1 shows the results of this experiment. The glass surface (A) was a microscope slide. The laser produced complete ablation (visual inspection) of the enhanced fingermark at all fluences except 18 kJ/m2, where it is possible to observe a faint trace of the original fingermark, suggesting that fluences below this level could result in incomplete material removal. The polystyrene surface (B) displayed a similar trend, although the residual fingermark trace is less pronounced. For this surface, ablation of the plastic was also observed on the bottom right corner at 55 and 44 kJ/m2, respectively. This is the starting position of the scan, which received 20 additional laser shots compared with the rest of the surface resulting from a delay of 1 s between laser Q-switch activation and stage movement trigger. In addition, both ends of each scan line of the serpentine pattern were irradiated slightly longer at the turn-around point, which resulted in the higher material removal visible in the squares ablated on aluminum and cardboard surfaces. Ablation from the aluminum surface (C) resulted in almost total removal of the fingermarks at all energies, whereas cardboard (D) was the most easily ablated surface and ablation was observed even at fluences as low as 14 kJ/m2. The main component of cardboard is cellulose fiber, which is rich in OH groups and may contribute to the laser radiation absorption together with moisture, which can reach 8% under ambient conditions . The cardboard ablation resulted in removal of both fingermark and paper material. However, filters used to capture material from the cardboard surface did not show any sign of clogging or presence of particulate other than the powder used for the development step. The capture capabilities of the system were tested using a small molecule standard. Aliquots containing 100 ng of caffeine were deposited on a glass microscope slide and allowed to dry. A finger was rolled on a dry caffeine spot about 5 mm in diameter and subsequently transferred on a second surface. The fingermark was enhanced with carbon black powder and the resulting trace was ablated and captured using a 4 mm syringe filter held about 2 mm above the ablation spot and connected to the vacuum source. Ablation and capture were conducted on the 5 × 5 mm area of the fingermark that covered the contact zone between the finger and the caffeine residue. The material captured from the latent fingermark was dissolved in 50 μL of water. Samples were then vacuum dried and resuspended in 2 μL of matrix solution before being loaded onto the MALDI target plate. Figure 2 shows spectra obtained from these experiments. The captured caffeine yielded an ion signal for all tested surfaces about one order of magnitude lower than the corresponding control, which had 100 ng of caffeine on target (Figure 2e). Over 70% of the detected peaks were common to the caffeine standard and the ablated and captured samples. The peaks that were not common could not be assigned to a unique compound, although peaks such as the one at m/z 104.1 in the spectrum obtained from the glass surface may correspond to the amino acid cysteine, which has been previously reported as a component of fingermarks . Notably, no signal could be uniquely identified from common fatty acids, such as oleic acid or palmitic acid that have previously been reported as fingermark components [12, 42]. This may be due to the fact that the extracts were reconstituted using 50 μL of water, which may not solubilize the lipids. In addition, the MALDI matrix used in these experiments is not ideal for the ionization of free fatty acids . Samples from ablation of cardboard did not show any peaks that could be assigned to chemicals used in the manufacturing process . Cardboard is a porous material and handling fingermarks on its surface is often difficult . Considering that the depth penetration of the IR light is only a few micrometers , it might be expected that the caffeine could diffuse through the porous cardboard and be difficult to remove by ablation. However, the caffeine signal from the cardboard surface had a comparable intensity compared with less porous surfaces such as glass and aluminum. At the same time, it should be noted that old fingermarks may present a challenge because analyte penetrating deep into the cardboard may not be easily extracted. Additionally, it may be difficult to distinguish and correlate the various compounds detected in the porous material at different times. A common component in forensic evidences of sexual assault cases is condom lubricant, which can be important associative evidence . Although spectroscopic methods such as Fourier transform infrared spectroscopy (FT-IR) are commonly used in the analysis of this type of trace compound , mass spectrometry has emerged as a powerful tool for condom trace evidence analysis , and MALDI imaging has been used for trace analysis of condom lubricants . Figure 3 shows a representative MALDI spectrum recorded from a sample of a captured fingermark, which was exposed to the lubricant of a condom immediately after opening the wrapper. The fingermark for this experiment was prepared and ablated in the same manner as in the previous experiments, with ablation and capture from a 5 × 5 mm area. The captured material was dissolved in acetonitrile and deposited on the MALDI target with DHB matrix. The peaks spaced by 44 m/z units indicate that this lubricant contains a polyethylene glycol polymer (PEG). Bradshaw and co-workers  reported MALDI analysis of condom extracts which present ion signal patterns similar to Figure 3, although their results show two or more PEG patterns in each sample, which is most likely the result of a more efficient liquid extraction using tetrahydrofuran and dichloromethane in addition to acetonitrile. In a previous work, Musah and co-workers used DART mass spectrometry to analyze sexual assault evidence, including swabs of fingermarks on glass surfaces . Whereas the detection of compounds related to condoms such as the spermicide compound nonoxynol-9 was reported, the mass range of DART did not allow detection of the polymer components of the lubricant. Infrared laser ablation can be used to detect small biomolecules in fingermarks. Figure 4 shows the MALDI spectrum of a sample ablated and captured from a fingermark after contact with a commercial antibacterial cream. The detected peaks belong to cyclic peptides of the bacitracin family, which are commonly used for topical antibacterial preparations. Detection of peptidic antibacterial components in fingermark by mass spectrometry has not previously been reported. Another class of important compounds in forensic analysis are explosives. Figure 5 shows GC-MS chromatograms from a standard mixture of explosives (EPA 8330 Mix A) captured from samples with and without fingermark. For these experiments, elution of captured material from the filters was conducted with acetonitrile, and the total ion chromatograms revealed the presence of several sebum components , such as oleic acids, which were not identified in previous MALDI experiments where water was used for extraction. Figure 5a shows the signal recorded from the sample captured from a fingermark left on a plastic surface after contact with the explosives mixture. Figure 5b shows the signal recorded from ablation and capture of the same mixture after direct deposition on the same plastic surface without any transfer of material via fingertip contact. For each sample, an aliquot containing 100 ng of eight different explosives was deposited on a plastic surface and allowed to dry. One aliquot was ablated and captured immediately (Figure 5b), while another was used to produce a fingermark as previously described (Figure 5a). Two of the explosives, RDX and HMX, were not detected in the laser ablated or in standard runs. A third, NB, could be detected but produced fragments too small for selected ion monitoring (SIM) detection and often resulted in inconsistent identification based on NIST database scores. The five remaining explosives were detected and identified from the fingermarks. Infrared laser ablation with vacuum capture was demonstrated for sampling and off-line mass spectrometry analysis of latent fingermarks. Infrared laser ablation is able to remove and capture material from surfaces, including cardboard, aluminum, and plastic, and sampling efficiency was independent of the surface. In MALDI experiments, caffeine was detected from fingermarks created by pressure of a finger on surfaces containing amounts as low as 1 ng. With direct MALDI analysis from the capturing membrane, it may be possible to analyze the material with greater efficiency. The comparable signal obtained from different surfaces suggests that a quantitative detection may be possible. Sampling of a broad range of chemical classes was demonstrated, from small molecules such as drugs and explosives to larger ones such as peptides from antibacterial creams and polymers from condom lubricants. The stability of the compounds on the membrane after the capture process is a concern; however, the filter can be sealed to improve compound stability and avoid post-capture contamination. Future work will focus on developing a portable sampling system by coupling the IR laser beam to fiber optics. In addition, extension of the technology to other enhancing techniques such as cyanoacrylate fuming will be explored. This work was supported by the National Science Foundation grant number CHE-1152106.